DIY Coffee Scrub: Can It Really Treat Cellulite? I’m totally ok with my cellulite now. I’m not gonna lie. It wasn’t easy. It took a lot of work, tears and compassion to get to a point where I love my body the way it is, warts and all. FYI, cellulite isn’t a wart. It’s not the disease or flaw the media makes it out to be. Cellulite is totally normal. 98% of women has it (yes, even supermodels!). But there was a time when I’d have sold my kidney to get rid of it. Back then, I tried EVERYTHING. Including scrubbing my thighs with coffee grounds. Magazine swore it’s the best DYI anti-cellulite treatment. Ok, the science here can get a bit complicated, so I’ll try to make it as simple as possible. Cellulite happens because of the way fat cells arrange themselves under the skin. If this distribution is uneven – and it usually is – your skin becomes strained. Hello, dreaded dimpled look! If you want to get rid of cellulite, you need to break down fat. This process has a name: lypolysis. Lypolysis is controlled by enzyme HSL, which is itself activated by PKA (Protein Kinase A). Are you still with me? This means that, to get rid of cellulite, you first need to increase the amount of PKA. You can do this by controlling something called cyclic adenosine monophosphate (AMP). But, there’s a problem. Another enzyme, called PhosphoDiEsterase (PDE for short) breaks down AMP. So, the first thing to do if you want to say goodbye to cellulite is using a PDE inhibitor to get rid of it. Guess what? Caffeine, which we all know is found in coffee, can do the job. So, to recap, the theory is this: caffeine inhibits PDE, which leads to more AMP, which breaks down more fat, which reduces cellulite. So, Why Won’t Coffee Get Rid Of Cellulite? 1. Can Caffeine Penetrate Skin? Yes and no. It depends on the vehicle used to deliver it into the skin. With a good penetration enhancer, it may penetrate well enough to do the job. But, these scrubs usually mix coffee grounds with olive oil or coconut oil, and these prevent, rather than help, caffeine from getting into the skin. But hey, at least your skin will be silky soft and well-moisturized. 2. How Much Caffeine Is In Coffee Grounds? Coffee grounds have caffeine, obviously. But, did you know you have to brew them to get it out? Dry coffee grounds only have around 5% caffeine. If the caffeine can’t get out of them, it surely can’t get inside your skin. 3. How Long Should The Scrub Stay On The Skin? Remember when I said that the rate of penetration of caffeine depends on the vehicle? Well, even with a good vehicle, like a gel base, it can take up to 6 hours to fully penetrate the skin. Are you using a scrub for that long? Me neither. And, even if you wrap the scrub under plastic wrap, it’ll still be very uncomfortable to wear for that long. But, What If You Do Everything Right? Ok, so maybe you’re willing to brew the coffee grounds, use a good gel base, and leave it on your skin for hours. Still, there is no proof that applying caffeine on your skin can do the job. The only study I found about the effects of topical application of caffeine on the skin was performed on pigs. And, even then, only when combined with ultrasonic waves. Caffeine alone didn’t work. Stop wasting good coffee, and accept your cellulite. It’s the only thing you can do really, and even if it sounds impossible now, it will make you much, much happier in the long term. I promise. Have you ever tried scrubbing with coffee grounds to get rid of cellulite? Share your experience in the comments below. 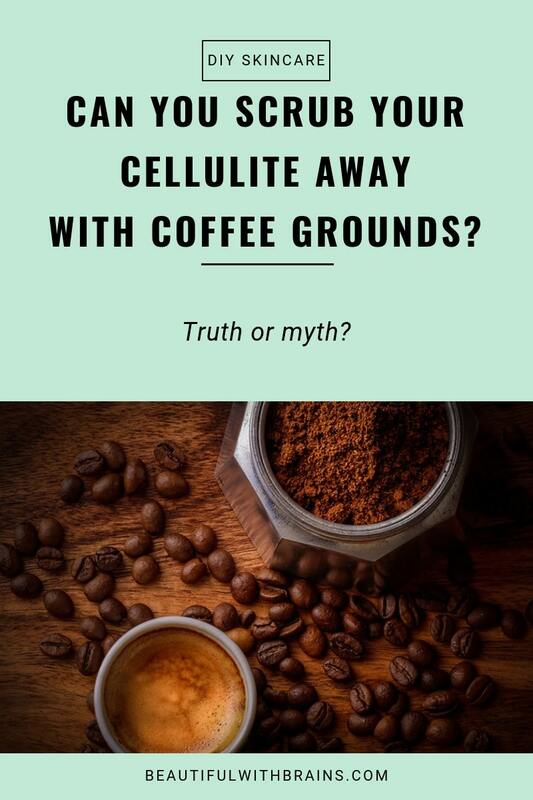 I believe I heard somewhere that taking green coffee bean extract can help reduce cellulite…..cannot confirm it and aren’t that interested in looking into it because I don’t suffer from cellulite. But coffee scrubs smell delish!!! Just for that olfactory pleasure, I’ve already made some DIY coffee scrubs, with caster sugar, pink salt, cinnamon and avocado oil. Never bought already made coffee scrubs though.